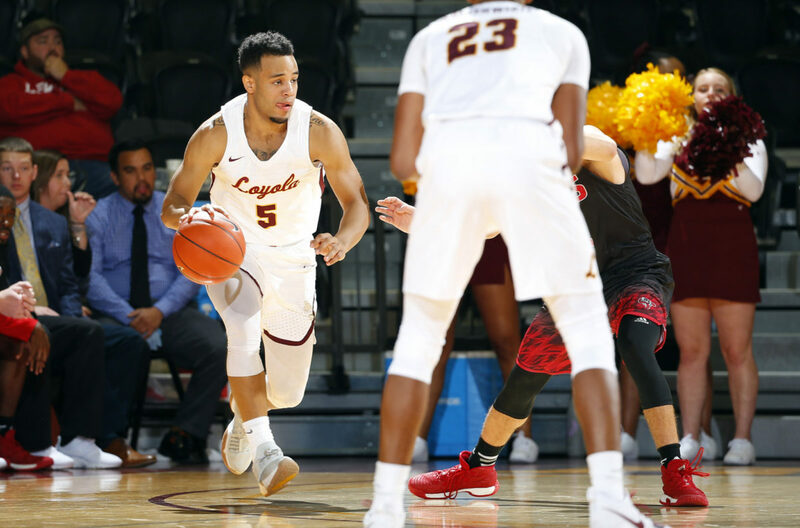 Steve Woltmann | Loyola Athletics Redshirt junior Marques Townes' 22 points helped lead the Ramblers to an 76-66 victory over Evansville Feb. 18. What went down: The Loyola men’s basketball team (23-5, 13-3) traveled to the University of Evansville and defeated the Purple Aces 76-66. The victory meant Loyola clinched at least a share of the Missouri Valley Conference (MVC) title for the first time in program history. This also marks the first time Loyola has clinched a conference title since the 1984-85 season. How it happened: The Ramblers struggled in the first half, committing nine turnovers and trailing 28-27 at the break. In the second half, Loyola stormed back, shooting 70 percent from the field –– 50 percent from three-point land –– and outscoring Evansville to complete the comeback. Analysis: With Southern Illinois University’s victory over Indiana State University Feb. 17, Loyola could only clinch a share of the MVC crown. The Ramblers continued to be a second-half team, shooting 14-of-20 in the second half to seal the victory and maintain a two-game lead over Southern Illinois with two games remaining. Four Ramblers –– redshirt junior guards Marques Townes and Clayton Custer and senior forwards Donte Ingram and Aundre Jackson –– scored in double figures. Townes dropped 22 points, while Custer had 17 points, seven rebounds and six assists. Ingram had 14 points –– 10 of which came in the second half –– and Jackson had 11 points on 4-for-6 shooting. The balanced scoring attack has been key to Loyola’s success this season and was the difference in the win. While Evansville guard Ryan Taylor scored 27 points, no other Purple Aces scored in double figures. Sophomore guard Cameron Satterwhite returned to the rotation after being suspended one game for an unspecified violation of team rules. His return gave head coach Porter Moser a chance to give his guards –– specifically senior Ben Richardson –– more rest. 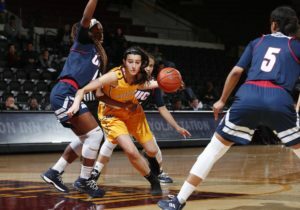 Although Loyola committed 19 turnovers –– seven from Richardson –– the hot shooting and rebounding ability kept the Ramblers in the game. They grabbed 31 rebounds compared to Evansville’s 22 and scored 28 points in the paint. What’s next? Loyola is scheduled to travel to second-place Southern Illinois Feb. 21 for a chance to secure the No. 1 seed in the MVC tournament.